This 2019 Laredo 275RL by Keystone RV is on our sales lot in Bedford VA! 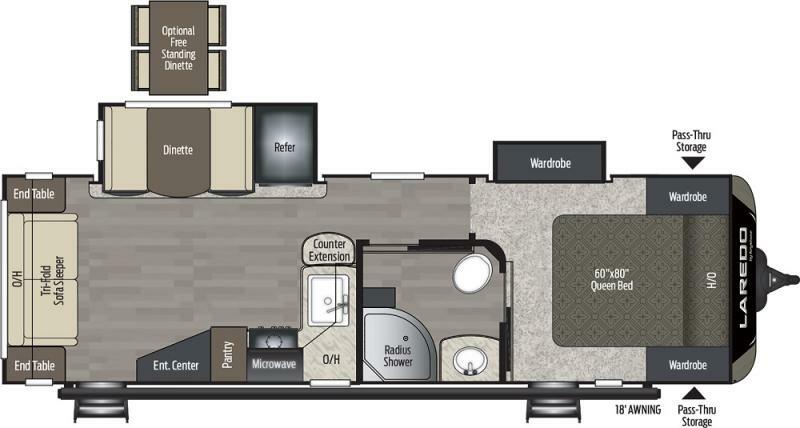 This is a new floorplan that is a great layout! This trailer has a Dinette and the 8 cu ft refer in the Slide with a Hide a Bed in the rear. The main Kitchen is across from the Refer. The corner entertainment center is just to the right as you enter the door and the TV can be seen from both sitting areas. The front has a Queen Bed and the bathroom can be entered from the hall or front bedroom. This trailer has the Life Size Package, Black Label Edition, LCI Folding Steps, Solid Surface Countertops, Painted Front Fiberglass Cap, Electric Stabilizer Jacks, Power Front Jack, 15K AC with 50 amp service and prepped for 2nd AC, Free Standing Table and Chairs. Laredos have Solid Hardwood Cabinetry, Solid Surface Countertops, Furrion Oven, Furrion Back Up Camera Prep, 16.2 Quick Recovery Water Heaters, Lighted and Heated Pass Through Storage, Frameless Windows, and LOTS MORE!